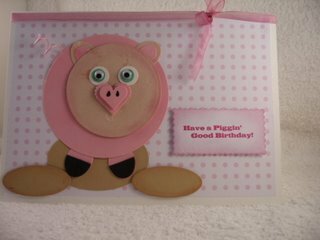 This Piglet Card is an easy to make idea, that is sure to raise a smile. Here's a card that will raise a smile with your friends and one that children are sure to love. 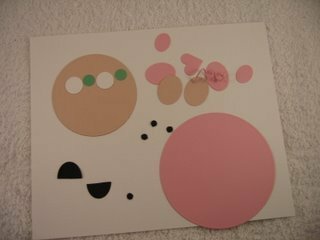 It is also one that would be easy for children to make, just let them loose with your circle punches and some ovals. Wouldn't it make a great BBQ invitation? 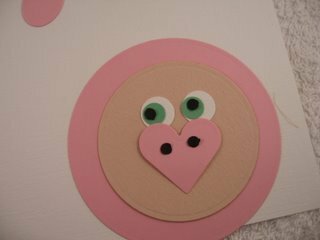 Cut out your circles in two shades of pink, one smaller than the other. Cut several ovals for ears and feet, and cut one black oval in half for the trotters. Cut white, green and black circles going smaller each time. Lay the smaller circle on top of the larger one. I used foam pads to raise it up from the body. The two different shades of pink will accentuate the head. Ink the edges if you wish. 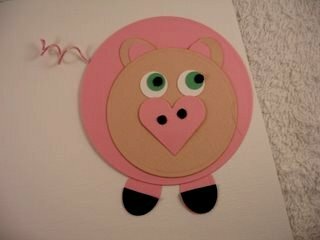 Add the two white circles, then your choice of colored card for the piglets eyes. The two black circles are next and then add a spot of white to give the eyes some expression. Or add "Googly Eyes" if you prefer. I have added a heart shape for the nose, using thin foam pads. Layer up the small ovals in the two shades of pink and make one smaller still, for the inner ear. Glue them behind the head. I have twirled some pink wire around a pencil and added it behind, and to one side of the piglets body. Add the feet to the bottom. Add the black oval, that you cut in half to them for the trotters. I have stood my piglet in some brown ovals... to represent mud ...just to make him feel at home! 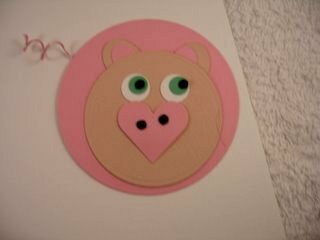 I have used "Googly Eyes" and made the snout from two hearts, one smaller than the other and used foam pads to raise them up. The nostrils have been drawn in with black pen. The sentiment is computer generated, and added to the card with foam pads. A little ribbon completes the look. Yet another Novelty Card for you to play around with. You could make your Piglet Card with muddy spots on him if you wanted to.